The road to perdition is paved with supersized fries, large shakes, and Big Macs. As ridiculous as this sounds it might be what the American culture leads one to believe. With the increasing number of ‘guilt-free’ and ‘sinless’ labels on food products, one might suspect that America has become so mad that it is no longer sin that arouses guilt in the heart but one’s caloric intake. It is not sin that takes one down to perdition but that extra slice of apple pie after dinner. When did it become sinful to fulfill a natural biological necessity for one’s survival? 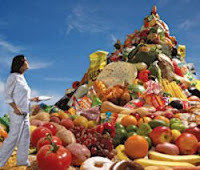 A person should not feel guilty about eating food -- unless they eat too much of it and be guilty of gluttony. People should feel guilty about sin. It is as if the bar that was set to judge one’s degree of guilt in the heart is no longer determined by the amount, nature, or degree of sin or sins one commits, but instead, by today’s standards, a guilty heart is the result of a high calorie diet. Since when did it become the case that the lower one’s caloric intake means the less guilty and sinful one is, while the higher one’s caloric intake means the contrary? With this line of reasoning one would assume that the starving in Africa are the pure and righteous of the world, while every person who dines on a Thickburger from Hardee’s is surely one bite from eternal damnation. Is it really any wonder that we fill our stomachs with empty things? For once the heart goes empty we seek to fill it with all sort of things in all sorts of places by all sorts of means. It only makes sense that since our hearts are empty and filled with nothing so too our stomach and bodies be filled and nourished by nothing. I think we have forgotten that it is not what goes into the mouth that can defile but what comes out of it.